First Came Fashion: Butternut Squash Mac & Cheese. 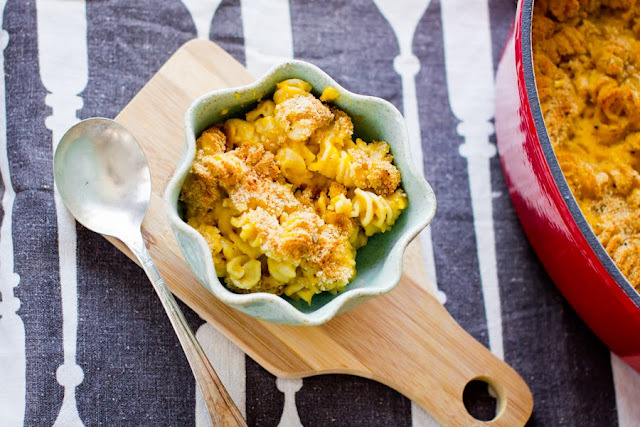 There's nothing better than butternut squash mac and cheese. Nothing. Directions: Preheat the oven to 350 degrees. Combine the butternut squash puree, milk, Greek yogurt, cheese, salt and pepper and garlic in a large saucepan, and stir until the cheese melts. Mix the butternut mixture with the pasta and pour into a greased baking dish. Top with bread crumbs and bake for 30 minutes, until the edges are browned. Switch the oven to broil until the bread crumbs turn golden brown, about 5 minutes.